Casa Del Rey, our exceptional listing on Siesta Key, is currently featured on The Business of Extraordinary Living, our exclusive Sotheby’s International Realty collaboration with the Wall Street Journal. 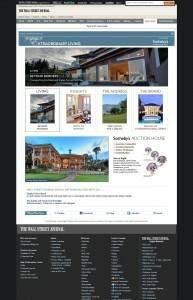 The Business of Extraordinary Living site was created to meet the special needs of our customers – the connoisseurs of life and the Wall Street Journal reader’s on wsj.com. Now in its third year, the site not only continues to provide visitors engaging real estate editorial, but positions the listings represented by our network to be showcased in a variety of distinctive marketing opportunities. Casa Del Rey, is now being showcased in the rotating eGallery through August 12th. Enjoy this opportunity to preview one of the area’s most exceptional waterfront estates.